Russell (Russ) Regnery grew up in Northern California. His early photographic influences included the master west-coast photographers of the era. He attended the University of California, Santa Cruz, and subsequently studied virology at the Australian National University (Ph.D.). Russ joined the staff of the Centers for Disease Control (CDC) in 1978 where he was involved with pathogen discovery and characterization as a Research Microbiologist for 30 years. Russ is the recipient of an honorary Doctor of Medicine from Uppsala University, Sweden, for his contributions to public health oriented medical research. Russ also taught evening photography classes at the Southeastern Center for the Arts (SCA) and was Workshop Director for the SCA for several years in the 1980’s. Organizing workshops for SCA provided significant inspiration derived from the invited workshop instructors including Alison Shaw, Bruce Barnbaum, John Shaw, Morly Baer, Galen Rowell, Cole Weston, and Jay Dusard. 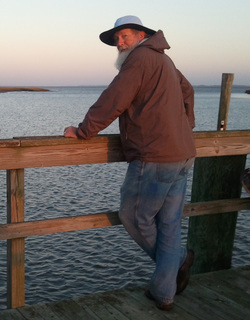 Russ initiated and led a series of photographic workshops for the SCA to the Georgia Barrier Islands, to the southern Appalachians, as well as to coastal California and the Canadian Rockies. He helped initiate The Photographers’ Circle, a workshop-oriented group of advanced amateur photographers from the Atlanta area. Additional significant photographic/artistic influences have included mentors, friends and fellow photographers Don Howard, Richard Green, Phil Davis, Mark Nelson, and members of the Ossabaw Artists’ Collective. Russ is currently one of the informal, organizational “fearless leaders” of the Ossabaw Artists’ Collective. Photography is for me all about about discovery and challenge. The personal search for compelling photographic subject matter can be an exhilarating quest. However, discovery of visually exciting material, that has the potential to transition into intriguing prints, is a relatively rare event, at least for me, and photographing the natural world is often dependent on a variety of factors that are not readily controlled or anticipated. And when visual elements, atmosphere, and mood do come together, two challenges still remain: effective image 'capture' and creative interpretation of the final image. Hopefully, this website is one way to begin to share some of the excitement, and perhaps occasional mystery, of original visual discovery that I experience. I photograph primarily with a large format view camera (5x7 or 8x10). The deliberate use of a traditional view camera obliges me to choose subjects carefully and photograph only those that interest me most. However, for me view camera photography is often rewarded by the expectation that the initial visualization stands a good chance of becoming a satisfying, high-quality presentation image. The Ossabaw Island Foundation’s Visiting Artist Program has provided a wonderful opportunity to periodically explore the island’s unique habitats and remnants of an extraordinary human cultural past, while interacting with a diverse variety of fellow artists.